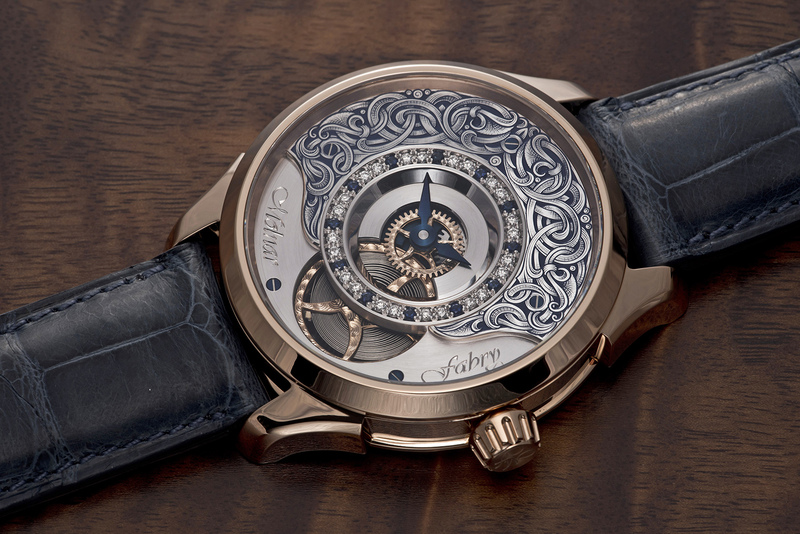 Known for creating custom timepieces distinguished by creatively finished and heavily modified movements, Slovakian watchmaker Molnar Fabry have just revealed the one-off Classic Gentleman Blue. 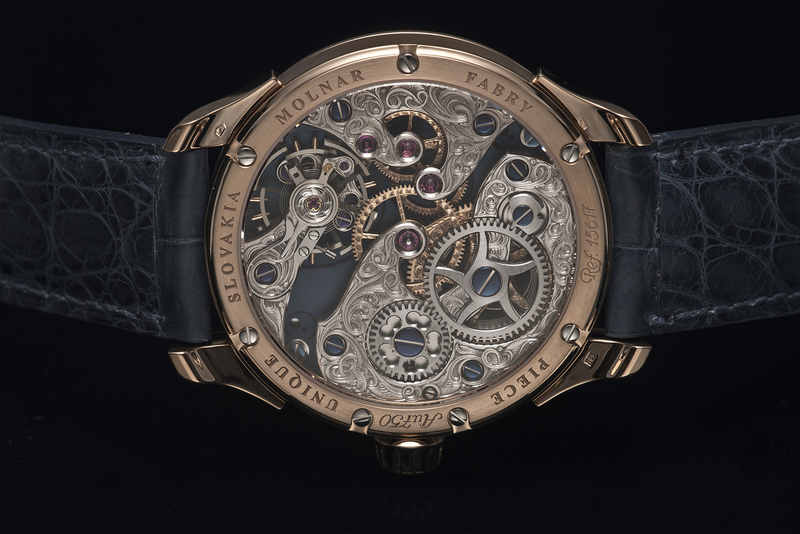 The watch not only showcases brand founders’ Michal Molnar’s and Igor Fabry’s virtuosity in engraving and hand-finishing, but also gem-settting – the duo having begun their careers as jewellers. As with their preceding models, such as the Time Machine Regulator 911 and the White Lotus Split Seconds, at the heart of the Classic Gentleman Blue is an extravagantly decorated stock movement, the ETA Unitas 6497-1. The Classic Gentleman Blue has a 44mm, handmade pink gold case with a silver dial that has been partially openworked, revealing the skeletonised barrel at six o’clock. Above the barrel sit a pair of blued steel, sword-shaped hands. Encircling the exposed center wheel is a ring of alternating white diamonds and blue sapphires, while the chapter ring is engraved with the “banknote” technique. A style of intricate and complex engraving used in currency printing, banknote engraving is characterised by finely engraved lines and dots filled with dark blue lacquer to create greater depth. 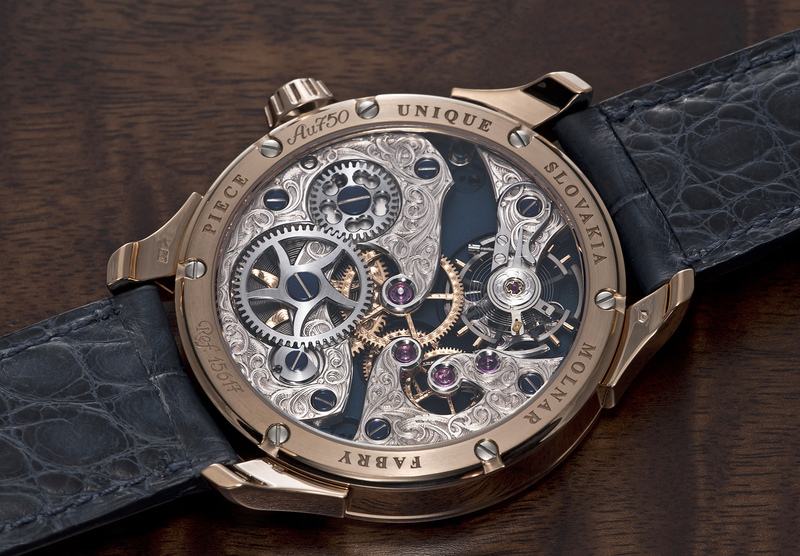 The caseback reveals the Unitas 6497-1 which has been refined almost beyond recognition. 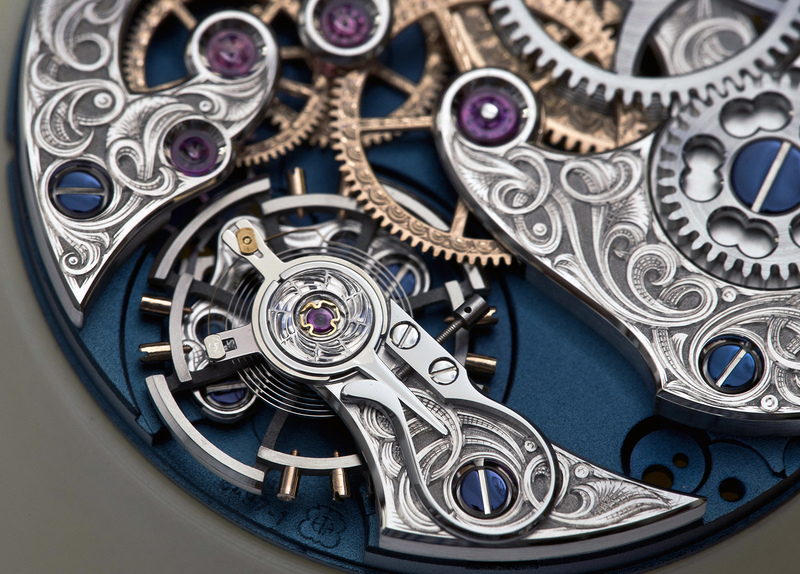 Unusually the main plate of the movement is finished in two colours on each side: blue rhodium coating on the back, while the dial side is white rhodium treated. The crown and ratchet wheels are skeletonised while the bridges are engraved using the same banknote technique as found on the front and secured with blued screws. 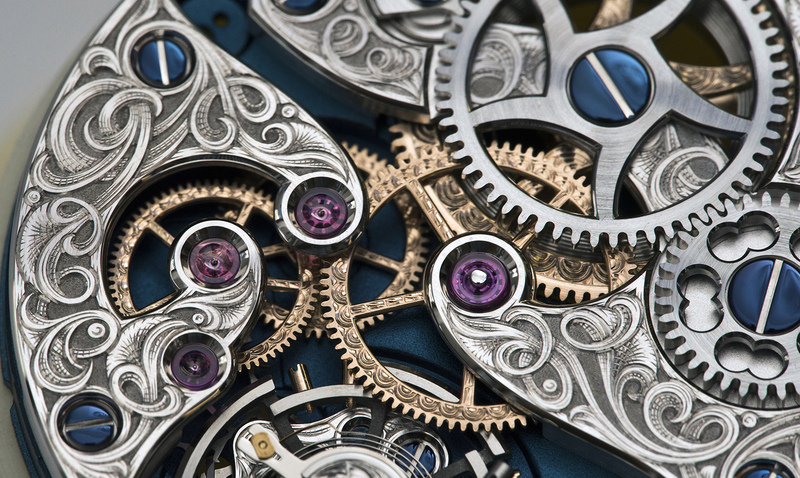 Even the spokes of the gears that make up the going train have been embellished with a hand-engraved pattern. 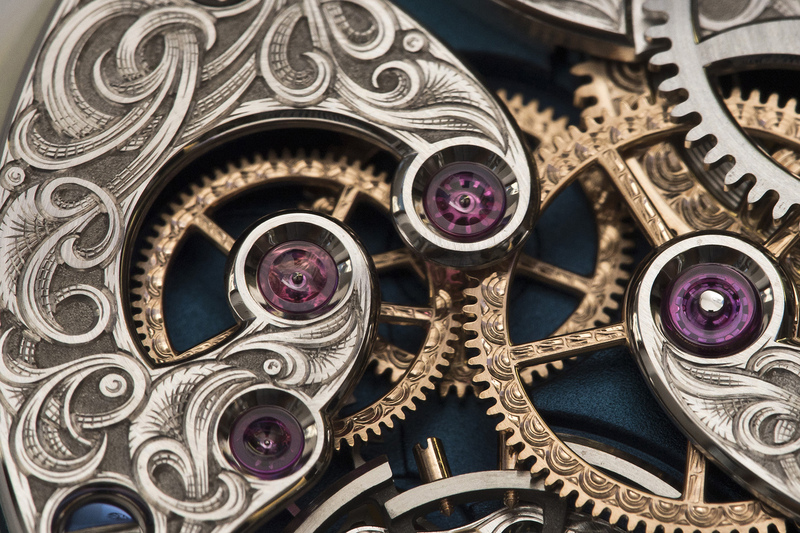 The watch is equipped with swan neck regulator for micrometric adjustment and a titanium balance wheel – designed and made in-house – with 18k pink gold poising screws. 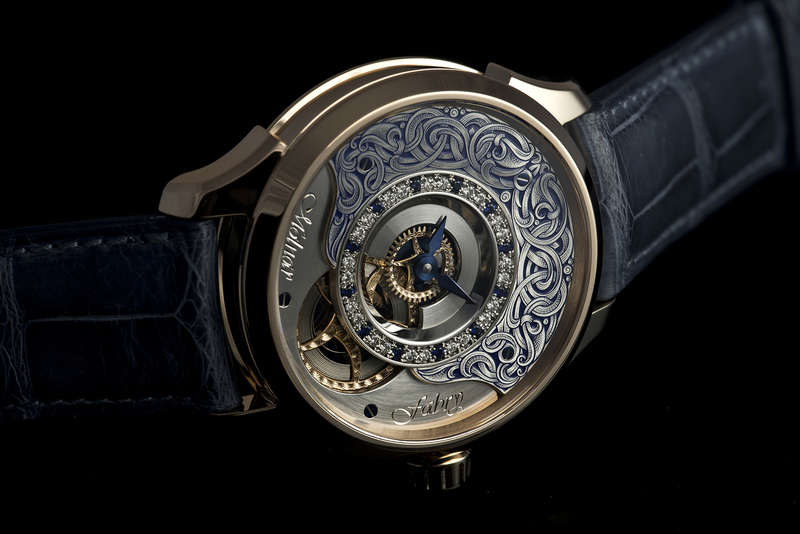 The Molnar Fabry Classic Gentleman Blue is a one-off and priced at €36,400 without taxes.